Michigan borders three of the Great Lakes – Superior, Huron and Michigan – which provides a suitable habitat for wetlands birds. The Wolverine State also features national forests, such as Manistee and Huron, for ground-dwelling and arboreal birds. Bird lovers may join the Michigan Audubon Society (michiganaudubon.org), an organization that raises awareness for the state's bird conservation and offers ornithological educational programs. The Ciconiiformes order includes all wading birds in Michigan. Wading birds are long-legged birds that wade, or walk slowly, in water in search for food. Most Ciconiiformes are omnivorous, meaning they eat vegetation and meat. Lakes, rivers and marshes are common habitats for Ciconiiformes birds. 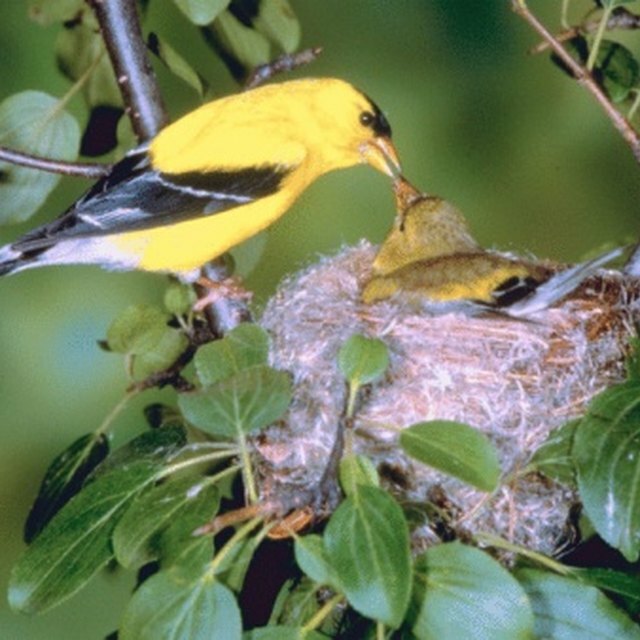 For nesting, these birds usually find spots on the lake shores or river banks. Michigan's Ciconiiformes species list features the white-faced ibis, wood stork, black-crowned night heron, snowy egret and American bittern. Most wading birds, such as the great blue heron, are largely migratory birds. Michigan is home to several species in the Pelecaniformes order. During the winter, Pelecaniformes live near the large saltwater oceans and estuaries. These birds flock to Michigan in the summer and live near Lake Michigan and Lake Superior. Most Pelecaniformes birds are carnivorous, feeding on small fish. To store their prey, Pelecaniformes have gular patches, or loose flabs of skin on their throat area. Brown pelicans, double-crested cormorants and northern gannets are some Pelecaniformes birds frequently seen in the summer. Double-crested cormorants are the only cormorants living in Michigan. All of Michigan's bird of prey species, or raptors, belong to the Falconiformes order. These completely carnivorous hunters prey on snakes, small birds, mammals and fish. Their sharp talons grasp their prey, and their pointed beaks allow them to easily devour meat. Birds of prey are diurnal, meaning they are active during the day. Since these birds hunt by sight, daytime is the most appropriate for birds of prey to hunt. Among Michigan's birds of prey species are red-tailed hawks, American kestrel, northern goshawk and the bald eagle. Galliformes are an order of heavyset ground-dwelling bird species. They have the capability for flight, but usually stay on the ground in search for food and nesting sites. Nesting sites for Galliformes birds are usually hovels covered by trees or tall grassy areas. Most Galliformes birds remain in Michigan throughout the year. One of the most common turkeys in the United States, the eastern wild turkey, is native to Michigan. Others common in Michigan are the northern bobwhite, ring-neck pheasant and sharp-tailed grouse. Many small, arboreal birds – ones that live in trees – fall under the Passeriformes order. These are also known as perching birds or songbirds. Passeriformes has more species than any other bird order in the Linnaeus classification system. 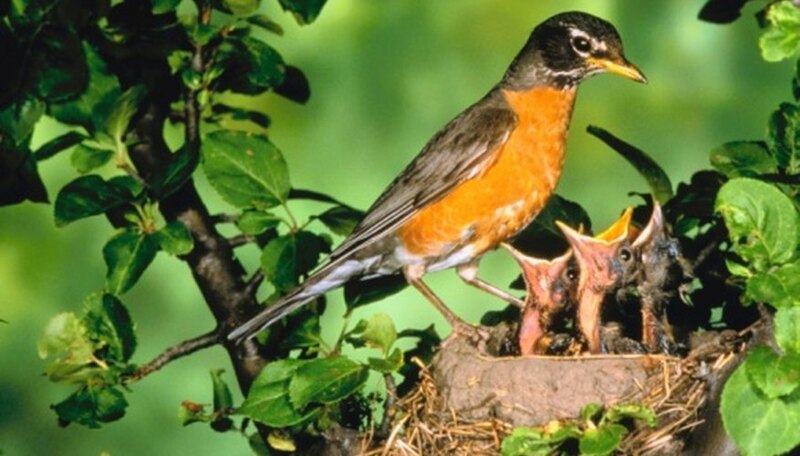 Sometimes these birds swoop to the ground for food, but all Passeriformes nest in tree branches. Flycatchers, kingbirds, vireos, shrikes, swallows and chickadees are some of Michigan's arboreal birds. Davis, Skip. "What Are Some Birds Found in Michigan?" Sciencing, https://sciencing.com/birds-found-michigan-8681361.html. 24 April 2017.